I didn't know they made the hearth and home blends. I like AJs va/per, Virginia spice and fusiliers ration just fine though. I stand by my statement on the private stock French quarter regardless. Cost is another factor that can influence an opinion. Cheap stuff is 'cheap', and expensive stuff is coveted. Availability may also play a factor in perception of worth. (Esoterica, I'm looking at you). I've smoked pounds of EGR, and never got a chemical or cigarette note. I've smoked a little Mixture #79, and noticed a slight syrup at times, but no chemical or cigarette taste. That may be your reaction to American burley. I generally like a wide variety of tobaccos, from different genres, so I am not extremely picky. However, Sutliff was recommended to me, by a local B&M shop manager, and it is the only tobacco I have ever taken back to the seller, and asked for a full refund. I didn't hesitate to ask for a refund on the opened tins either. The quality was so bad, I had no conscience. IMO, if I hesitate to give an honest opinion on a product I have sampled, I do a great disservice to the quality products that some in the industry, work so hard to develop and market. Since pipe smoking and collecting are my hobbies, and I never hesitate to lay down my hard earned cash for pipes and tobacco, I certainly have no reservations about giving an honest review of either. It reminds me of some of the Scotch and Bourbon reviews we see on You Tube. I sometimes wonder, if there are any offerings they didn't enjoy? Nobody gets more upset than I, when a quality seller of a quality product gets trashed on a public forum. The reality to it, is that there IS a market for tobacco of this quality, and Sutliff is selling a lot of it. However, I cannot with clear conscience recommend it to anyone, who I am encouraging to continue to participate in the hobby. I could recommend that Sutliff step up their game, but my guess is they like the profits in the league they are playing. It's like trying to compare Heaven Hill to Four Roses Barrel Strength. Two distinctly different products, marketed to two distinctly different markets. Sutliff either is or isn't the same quality base tobaccos as the other suppliers of tobaccoweed for the pipe. Seems perfectly clear to me, and I shall proceed accordingly. Jim who originally made EGR was a sutliff back in 1946 when it first came out? I thought it was made by someone else but it smoking pipes says sutliff, probably a mistake right? Who was the og blender? Pretty much everything, including EGR. I was being facetious above, or at least attempting to be. I didn't know they made the hearth and home blends. I like AJs va/per, Virginia spice and fusiliers ration just fine though. Yep. Virginia Spice is excellent, as are a number of H&H blends. As far as the Sutliff Private Stock stuff goes, last year I smoked through tins of Breckinridge, Maple Street and Great Outdoors. I enjoyed them all. Breckinridge was a stand out, and sadly it's been discontinued. thanks jim, did sutliff buy it in the 60s? have yu smoked the og version? I'm not certain when Sutliff bought it. I fairly sure it went to another company inbetween. Seems to me I heard 1974, but I'm afraid to say that declaratively, and I'm not sure when Sutliff acquired it from whoever bought it first. 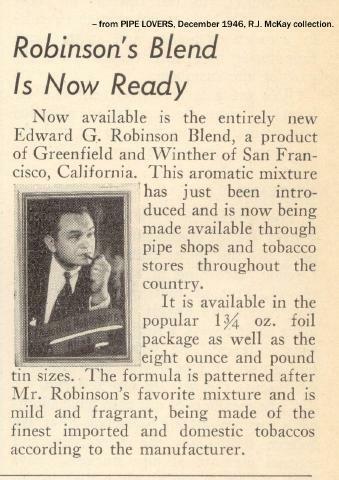 I was told Sutliff is using the original formula, and btw, they pay royalties to Robinson's grand daughter. I have smoked two different 1960s versions, and still have some left of the early '60s. They taste pretty much the same, though the older one gathered some spice, likely due to age. The topping seems similar, but the new stuff is a little deeper in flavor, and again, I figure some topping may have been lost with age on the old stuff. Funny you ask because I'm going to a show on Saturday and taking some with me, so Ill try again and see how it is. I have a habit of not going back to line tobaccos once I get burned badly. I notice some lines are more or less the same blend with different toppings. That stuff tore my mouth up badly. It smelled nice enough, but was bland. I don't generally smoke for room note, I go for taste and nic content. Yes. I'll be at Basil Meadows' table helping him, smoking outside, and generally finding ways to get everybody arrested.